Here's one I made a few weeks ago which was just about the best I've ever made. Or at least it was the way I like it with a very crisp crust and tangy, not overly sweet filling. It's the lemon, egg wash, and slightly longer than usual cooking time that give it the edge. Line bottom of a pie pan with crust. Wash the berries; remove the stems. Mix with dry ingredients. Sprinkle w/lemon juice. Place berries in the bottom crust. Distribute bits of butter over the berries. 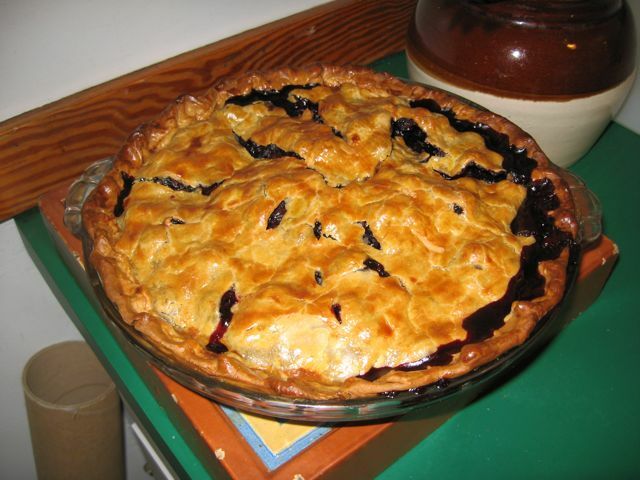 Cover with top crust and crimp the edges all around. Cut vents in the crust. Brush on the egg wash.
Bake 45 minutes at 400 degrees. (I put it on a cookie tin so it doesn't bubble all out over the oven.) Leave it in longer if it's not as brown as you like it. SERVE warm with, what else, vanilla ice cream. Blueberry variations? Peach pie anyone? Plum torte? If you have a favorite summer recipe (or want one) please, share. Thanks for a terrific idea for dessert tonite Hallie! A couple of thoughts. I usually take 3 or 4 one inch strips of aluminum foil and crimp them around the edge for the first 1/2 hr or so of baking. That way the outer crust doesn't burn or overly brown. I also find the blueberries used do actually make a difference in the taste as the offseason hothouse big berries are often blander or on the sweet side, while the real Maine lowbush berries are slightly more tart, and trigger a wider array of taste buds. In other words, higher YUMMY factor. Try both and see if you agree! Thanks for a tasty post. su Amigo. I agree, "Amigo" -- Maine lowbush are preferred. Tangier. Thanks for the tips! Love, love blueberry pie, especially the silky texture of it. But my husband refuses to eat it. Can you imagine? And there's now way I'm making a whole pie just for me and my hips. I wish I had written down how I made the best pie ever. I didn't have enough raspberries to make a pie, and company was coming. So I used nectarines and raspberries. Oh, my goodness, was it delicious. It kills me that I can't remember what proportions, or what else went into it. Tangier? I thought...where? And then I realized that's Tangiers, anyway. Hallie, this looks absolutely delicious! I tweeted! Yum. Anon - good tip about the foil over the edge of a pie. Actually, great tip. Karen - always consider 3 cups of combined fruit in a pie. I like blueberries, but I adore nectarines and raspberries.